Phillis Wheatley was born in the area that is present-day Senegal or Gambia. 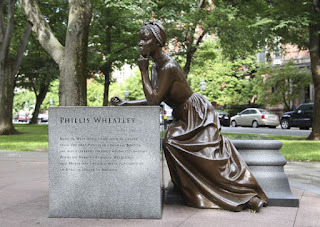 Phillis Wheatley was kidnapped by slave traders along with other girls when she was eight years old and purchased at an auction in the summer of 1761 by the wealthy Christian merchant John Wheatley to work as a personal servant. However, she was assigned only very light work because of her frail health, thereby, the slave was raised as a member of the family, thus he received a better education than many white girls of her epoch, she mastered all reading as well as writing skills. So talented Phillis Wheatley was that her adopted family made her read the poems she started to write in social gatherings. She had a witty conversation and people were amazed at her because she was a black girl, who had been sold as a slave, and it was believed black people were not capable of having such skills. She published her first poem at the age of 14. John Wheatley tried to help her publish a poetry book in Boston, but he could not find enough subscribers and had trouble convincing American publishers that a black girl was capable of writing such fine poetry. As a matter of fact, the govern of Massachusetts, eminent ministers, politicians, and merchants signed an attestation in which they certified the black girl was skilled enough to write the poems. Her family took Phillis Wheatley to London in order to publish, promote and seek support for her book of poetry. The book “Poems on various subjects, religious and moral” (1773) made her the first black person in publishing a poetry book. Her poetical genius was forgotten, inasmuch as nor the quality or the contents of her poems drew a great deal of interest, but what was important for the audience was to discover a black female slave was able to write poetry. She compared herself to Terence, the Roman Empire writer who was brought to Rome as a slave and later became a renowned author. However, once she came back from England with her book just published and she obtained freedom, her life changed for worse, she married a free black man who was always in debt. She had 3 children who all died in infancy. Finally, Phillis Wheatley passed away in total poverty at the age of 31 after being unable to obtain enough support to publish new books. vanilla. You could look at Yahoo's front page and see how they write news headlines to get people to click. get people interested about what you've got to say. In my opinion, it would bring your blog a little livelier. Thank you, I have recently been looking for information approximately this topic for a while and yours is the best I have discovered till now.